Its like a pancake !! I love pallapam,veleppam and pancakes too.But never tried pancakes with coconut milk,always use milk. Never used yeast in aappam preparation! Nice recipe! I have never heard of these...they looks so yummy. Reminds me of dosas! Julie, nice making of palappam this way. I do make maida dosa with egg but never tried adding coconut milk. A must try one and the chicken curry luks yumm. Super inviting and Yum Palappam Dear.Luv it with Chicken Curry. Perfect combo, nothing to beat this. Looks very delicious. lovely and tasty appams, great combo with chicken curry..
great combination but i never tasted palappams before n would like to give a try :) looks inviting!! Julie I will try the traditional palappam. I love your combination of coconut milk in chicken curry as well. Great combo indeed! Thanks for dropping by my blog. This looks yum!!! Have to try this out. i love palampams and thick curry... mmmmm yummy to start your day! this is great recipe! 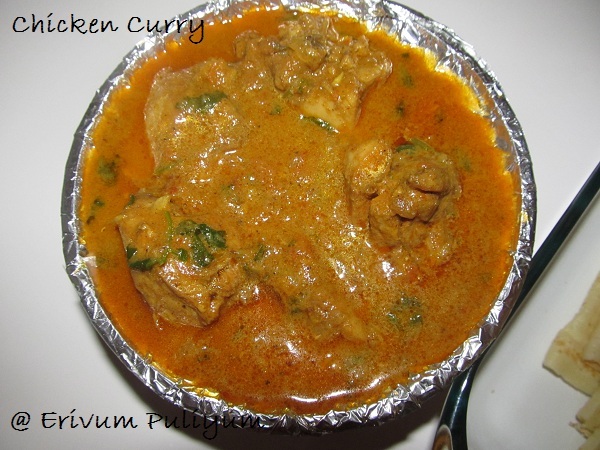 We love chicken curry, but have never had them with pallappam; a must try. I can imagine how nice this dish is. Thanks for sharing this, Julie. Palappam gives an entirely differnt picture in my head so I was surprised when I saw the picture. And only when I read I understood the story behind it. The recipe is very similar to pancakes. I should give this a try. intersting..will give it a try soon! ende mummyum ethu poole oru appam undakkum...but ethinde peeru "palappam" aanu ennu enikku ariyillayirunnu...anyways thanks for this post..